The L.A. Guns are the glam slam Hollywood hard rock scene in the living, breathing flesh. Without this band, it is highly unlikely that the glam/hair/sleaze metal scene of the late 80's would have ever existed. To give you some idea of their influence, just three of the bands arising from their direct influence are WASP, Faster Pussycat and, oh yeah, a bunch of cats called Guns N' Roses. The tortured history of the Guns is too much to go into. Suffice it to say, they've had more members than AARP and their exploits of excess have become legendary. They've spawned TWO bands with the name "L.A. Guns", each claimed by one of the original members. 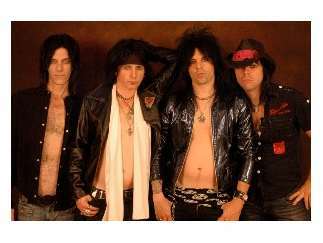 In 2013, the group headed up by Phil Black is still standing, with the Tracii Guns version finally bowing out. If you are interested in the gory details, Wikipedia and the band's own website can fill you in. Although never reaching the mega status of their immediate spinoff Guns N' Roses, L.A. Guns have enjoyed considerable success throughout the years and they are still a very active band today. It was with great pride that Wormwood conducted a "tag team" interview of original drummer Steve Riley and relatively new bassist Scotty Griffin. Many thanks to Scott Prinzing for his contributions to this article! SCOTTY GRIFFIN: I grew up in Los Angeles and have been playing since I was twelve. I started off on drums for a very short period, but grew up playing guitar. Never really went anywhere other than local gigs here and there. Then years later I was asked to play bass and things started changing for the better - more gigs and actually getting paid! Then I landed the L.A. Guns gig. STEVE RILEY: Have been playing drums most of my life. Started recording on major labels in 1975. Joined L.A. Guns in 1987. We have been recording and touring every year since. SG: Hopefully something that makes more money than music. SR: Hard to think of not being involved in music and drums. WC: What is the secret to your survival when so many of your contemporaries have disbanded? SR: We are lifers and are proud of our band and the songs we have written. SG: Just never give up. Find a way to survive. Whether it makes people hate you or look down on you, it doesn't matter. I'm not in this life to make anybody other than myself happy. And when I'm happy, then I want to make other people happy. On paper, that's the way life should work. Unfortunately, theory doesn't always translate perfectly into practice. But you do the best you can. WC: What are your thoughts on producing new music? Is there still an outlet for you to get the new material out there? SR: We love writing new material and know that is something that keeps us fresh. We are with Cleopatra Records and they have a nice network for sales and we also have the Internet — that is a great tool. SG: Oh, the usual suspects: The Beatles, the Stones, Led Zeppelin, Queen, Aerosmith, Van Halen. 70s glam stuff like Bowie, T. Rex, Sweet, Gary Glitter. I also like a lot of pop stuff like the Raspberries, Cheap Trick, the Babies, Jellyfish. And that's just the basic stuff. I kind of like all music in a way. I always try to have an optimistic way of listening to music. Even if I hate something, I try to find something — anything — to take from it. SR: So many bands have influenced us and I think it shows with the diversity on our CDs. As far as drumming: Mitch Mitchell and Ginger Baker. WC: What's ahead for you? SR: Touring the world again and going in to do some studio stuff at the end of the year. SG: Honest and sellable. I hope I never resort to playing music that I hate, just ‘cause I think it will sell. But by the same token, people speak with their money. If they like something, they'll buy it. If they don't really like it, they won't buy it. I hope I'm able to make music that I feel is real, and that people like it enough that they buy it. That goes not just for fans, but like a music coordinator for a movie or commercial, etc. SG: Anyone who was a rock star in the 60s or 70s that's still alive basically. SG: I'll answer that question with a question. Do you think stealing a car from a car dealership is a help or hindrance to the career of an auto salesman? SR: Downloading is going to happen, so go with it. It gets your name out there so look at as a tool in promotion. SG: I have nothing against that at all. In fact, I don't even have anything against a fan burning a CD or sending mp3s through email or whatever to another friend of our album. That's totally different than getting it for free from some megaupload site. In the first case you have a fan who actually likes our music giving it as a gift to another friend out of the sheer love of music, and not making any money off of it. In the second case, there's some company who doesn't know our music from a hole in the wall, and frankly doesn't even care, and they're making money off us through ads and subscriptions. All of which we, the artists, see 0% of. I know people like to put everybody on one side of the fence or the other. But it's not that easy. SR: With the phones now you can see our show on YouTube before it is over. So again, just go with it. SG: Mr. MegaUpload Man. See above for why. SR: I don't have too many enemies, so hard to say. SG: The band I'm in right now. I'm here and now. I don't like living my life waiting for the perfect thing to happen, or thinking there's something better out there that I'm not part of. It's like going out on a Saturday night looking for the happening party. You need to tell yourself, wherever I go is the happening place to be because I’m there. SR: John, Paul, George, and Ringo for the obvious reason. SG: Van Halen (with David Lee Roth of course) and Michael Anthony back in the band too. SR: Beatles, Zep, Sabbath, Deep Purple. SG: The last new CD I bought was Van Halen "A Different Kind Of Truth", which I thought was amazing. I usually buy used CDs though. My last haul included David Johansen "Crucial Music", Ohio Players" 20th Century Masters", London Quireboys "A Little Bit Of What You Fancy" and "This Is Rock N Roll", and Madonna "Like A Prayer". SR: I listen to a lot of classic rock from the 60s and 70s. SR: "8 Men Out". About the mob and the world series. SG: Other than Steel Panther of course, I'd say Alice Cooper. We actually opened for him, but I still consider I attended it since I watched his whole show. It's just so theatrical. I wish more bands would be like that nowadays. Not saying there aren't. I should rather say, I wish the powers that be would "promote" such bands instead of the boring crap that they shove down our throats these days. SR: After playing so many shows each year I don't go to a lot of other shows. SG: Oh, tons! Let's just start with Barry Manilow, end with 60s lounge music, and call it a day. SG: We've gotten lost a few times backstage trying to get to the stage. That happens more often than most people would think. SR: After 35 years there are too many to list. They happen all the time. SG: Antonin Careme, Alexis Soyer and Auguste Escoffier (look them up). SR: Blackie Lawless, Chris Holmes, and Randy Piper. SG: Buy our album. It'll make you sexier. SR: Come see L.A. Guns this year!